Is it its lighting processor controlled digital RGB (Red Green Blue) LED technology? Its ability to create an almost infinite pallet of colors to satisfy every mood? Its silky smooth remote control functions in 4 modes. Its award winning style, design and functionality? Or is simply the fact that this Jellephish mood lamp is one of the freshest, smoothest, coolest and most awe-inspiring gadget we have ever seen? You guessed it - its all of the above! Please don't put this in your aquarium as it will not swim we promise. Select this mode & see the lamp scroll through millions of colors. You can decide the morphing speed from 10 seconds to 16 minutes. 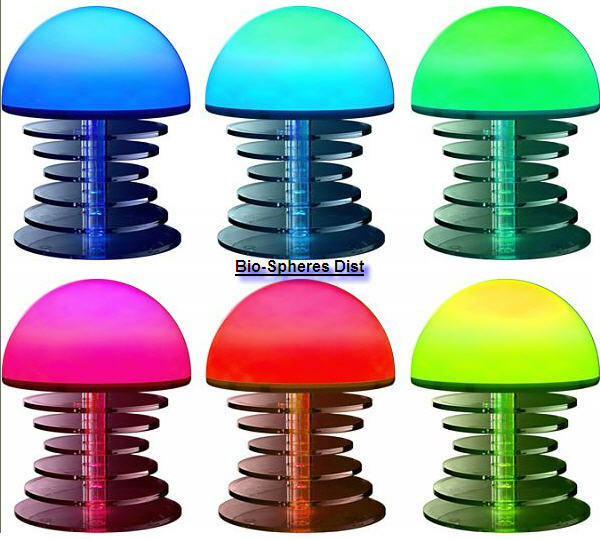 Allow the Jellephish to scroll through the colors & using the remote control select your colour choice. This mode produces a cool white light, with hints of red, green and blue to give a pearlescent effect. Use the select + button to increase intensity and select - to decrease intensity. The Pearlescent mode has five preset intensity levels, it will always begin in the highest level. In this mode the Mood Light will change color to music. TheJellephish mood lamp is freestanding using the acrylic base supplied, or the dome can be independently mounted flush against a wall. This is just one of the features that really sets the Mood Lamp apart. This product is not a toy. This product is not suitable for children under the age of three as it contains small parts and small packaging that may provide a choking hazard.